Improving your health, and your family’s, starts with staying informed. Hudson Headwaters Health is a print and digital magazine focusing on wellness and prevention. 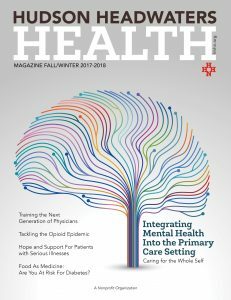 You can pick up your free print copy at any one of Hudson Headwaters’ 18 health center locations in the Adirondack North Country and Glens Falls region or read the digital version below. 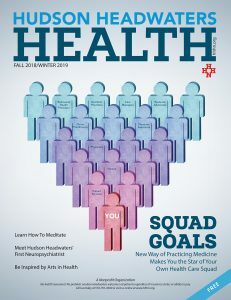 Magazine article topics range from diet and exercise to mental health to dealing with chronic health issues and are written by expert Hudson Headwaters providers, partners, and staff. 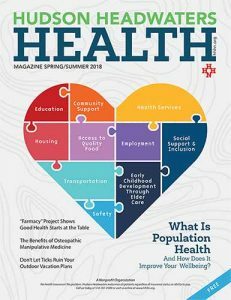 Each issue is packed with health-related resources that are available to our patients and supporters in Warren County and parts of Clinton, Essex, Hamilton, Saratoga and Washington counties. No matter your interests or health concerns, there is an article for you. We hope that you’ll take time to read, learn and explore the opportunities available to you to improve your health. Be inspired by art purchased for the Women’s Health Center at 90 South St.
Have you heard about Osteopathic Manipulative Medicine (OMM)?